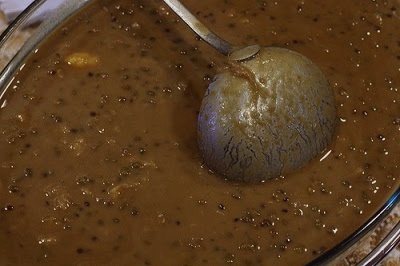 Bubur Kacang, the most popular of all bubur in the malay wedding menu. Bubur the word for porridge in Malay can be used for both sweet or savoury dishes. For sweet dishes, it is usually made with coconut milk – probably a combination of thin and thick coconut cream- and fuits, jellies, sticky rice, sago pearls or even dough made of flour and (more) coconut. Usually served hot on its own for tea. 1. Wash mung beans thoroughly. In a pot, boil mung beans in a liter of water. Turn the fire lower and leave to cook until the beans break. The beans will double or triple in size. Taste the texture, if it is still hard or al dente – add more water. I usually add a cup at a time. Do not skip this part – if the mung beans don’t break and turned mushy, the bubur doesn’t work at all. (do not add sugar yet). Add in sago. 2. Once the beans are ready, add in coconut milk, pandanus leaves, palm sugar and salt. Stir to combine. Taste for sugar. Add the muscovado sugar as you please. 3. Once the bubur reach the boiling point, lower the fire, stir to combine all flavours and leave to simmer for about 15-20 minutes. Keep tasting for saltiness and sweetness. If you fine the bubur to be too thick, add water and let boil again. 4. To make Bubur Kacang Berdurian, add the durian flesh at this point. To serve different people who wish to have it with and without durian, serve it with a jug of durian cream on the side, leaving them to add as they please. To make durian cream – combine durian flesh and 165ml of coconut milk in a pot and bring to boil. Add sugar and salt to taste. Serve immediately. Boil green beans in water until soft. Add sugar, milk, salt and sago. When sago turns clear, remove from heat. Presoak green beans for 1/2 hour to shorten cooking time. Hi ,Your site is excellent..I like everything about it and the food looks fantastic as well. You were the first person to review my site on google quite awhile ago through linkrefferal. I took your feedback and made changes to revise and reorder.When you have time I would appreciate it if you would have another look now and tell me what you think. i wanna try to make it. thanks for the simple but nice recipe!